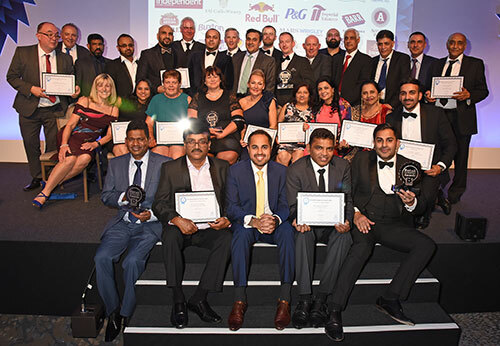 Now in their 18th year, the awards recognise independent retailers for their sales success and changes they implement after receiving expert advice from Bestway and over 40 of its supplier partners at three retail development seminars across the country. 18 prizes, totalling an impressive £50,000 in value, were handed out at the glamorous ceremony held at the Grosvenor House Hotel on Thursday 25th October. 12 prizes were awarded for category improvements, a community award was given, one national and three regional winners were recognised and the most esteemed title, ‘National Bestway retailer of the year’ was presented to Mr Gnanachchandran Tharmalingam of Four Seasons Wallasey, who picked up a sought-after prize cheque worth £10,000. To be eligible for an award, the retailers must first have entered and been selected to participate in the Bestway Retail Development Programme. The chosen retailers attended a two-day seminar consisting of one day of category advice and a one-day trade show where attendees were given hundreds of pounds of savings in exclusive on-the-day deals. During the seminar, Bestway and its’ suppliers provided business advice covering category management, sales opportunities and legislative guidance. The workshops also provide a great chance for retailers to network and share best practise among each other, as well as to talk to suppliers about upcoming new product developments. Following the seminars, the retailers had approximately four months to implement their learnings, before a panel of judges reviewed their store for the range of products they’d introduced, the space they’d allocated to each fixture in relation to customer requirements, POS used and merchandising equipment introduced, their pricing position against competitors and overall how this lead to better sales results. Tharmalingam is a customer of Bestway Liverpool and runs a number of stores in the North region. His winning store was recognised for the investment he’d made in store refrigeration, increasing the chilled offering and food-to-go and also major changes to the wine range. Dawood Parvez, who will take over from Martin Race as Managing Director in December this year and who handed out the National Bestway Retailer of the year award, commented: “At Bestway, we believe our retail customers can successfully compete and grow a profitable business in partnership with us, by implementing a few simple steps which will help to meet end-consumer needs for local, convenient shopping. The 2019 Retail Development Programme is now open for entries and will begin with three seminars in Scotland on 3rd and 4th April, Leeds on 1st and 2nd May and Hilton Heathrow Terminal 4 on 12th and 13th June. All Bestway Symbol Group, Club Member and Unaffiliated Retailers are invited to apply.